Trantor Everhot says 'Yes, yes!! I am a very busy man. I've got blueprints to work on, [dwarven wire] to perfect and formulae to calculate. In between those tasks, I have to find time to head down to Irontoe's and down a few Tumpy Tonics. Trantor Everhot says 'Oh!! 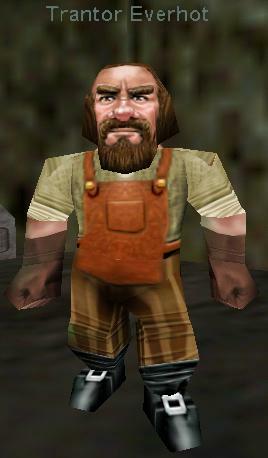 Interested in my dwarven wire, are you? Many are. I have no problem letting you use a spool, but I have to warn you that I have not perfected the strength of it yet. I will make you a trade. A couple of[Tumpy Tonics] for a spool. Trantor Everhot says 'Aaah!! I love Tumpy Tonics. They were created by Tumpy Irontoe. He was once a member of the famed Irontoe Brigade. Since they disbanded and left for parts unknown he decided to stay in Kaladim and open Irontoe's, the finest well in Faydwer. Trantor Everhot says 'Great!! I did not have the time to get down to Irontoe's today. Here. Like I said. A spool of dwarven wire. Now go away. I ain't sharing these tonics. I was also given some Dwarven Wire .